I know so little about poetry that I needed Google to even recall that the phrase above is from a Robert Frost poem. Needless to say, this isn’t a post about poetry. Rather, it’s a post about why I’ve been so bad about posting anything over the past quarter or so! I conveniently failed to provide actual data on my weight, noting only that I was *way* too heavy and definitely into the realm of obesity. So this time, I’ll confess to actual numbers; I hope that sharing this will motivate me not to return to my old weight, at least not too quickly. Unless Google serves some really nice dessert! Which it… often does. I knew I’d gotten at least somewhat heavier, but it wasn’t until I got the scale back out after Valerie and the kids left for Toronto that I realized just how heavy I was – 204.6 pounds. And that was even my weight after doing some moderate exercise, meaning my real fully hydrated weight was probably even higher. I just couldn’t ignore this, so I set aside the plans I’d made for the time the family was in Toronto, and focused on making the biggest dent I could in the 8 days that I had. 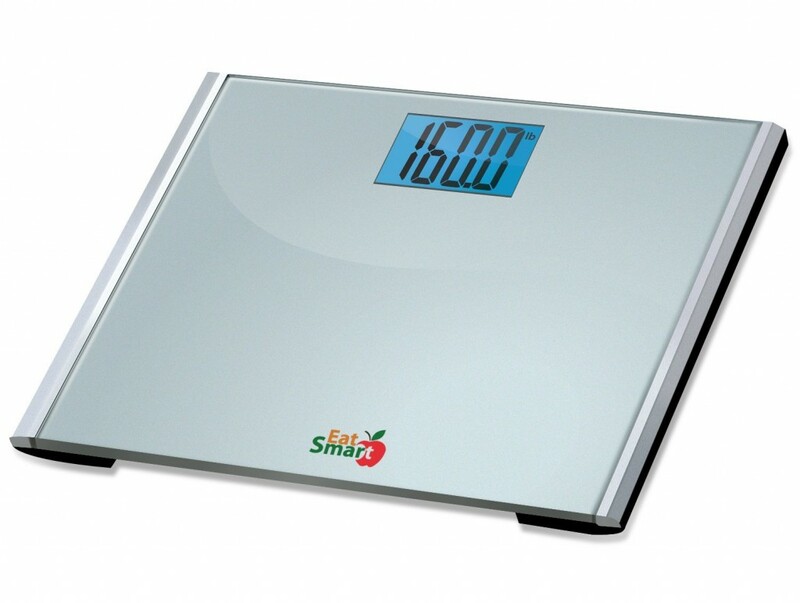 All in all it’s a really nice simple scale that seems quite accurate and makes it much easier to meaningful measure changes. Having said that, my body weight fluctuates very significantly throughout the day, as I’m sure is the case for most people, so it’s pretty important to measure yourself under consistent conditions. On the final day of Phase 2, there was a 5 lb difference between my pre and post exercise weight! Some people actually enjoy exercise. Now, I enjoy sports like badminton or tennis that you can play with friends. I even enjoyed tumbling down the ski hill with my vastly more accomplished Google colleagues. But I pretty much despise doing exercise for the sake of exercise. So much so that I’m very good at procrastinating or avoiding exercise, hence steady weight gain despite having all the necessary equipment at home. The only thing that enabled me to stick it out over a half year or so was availability of entertainment – and a boatload of luck. The first part of that luck was in having a perfect setup – both in having the space in our home for a nice setup, and being lucky enough with my current and past jobs to be able to afford some decent exercise and entertainment gear. 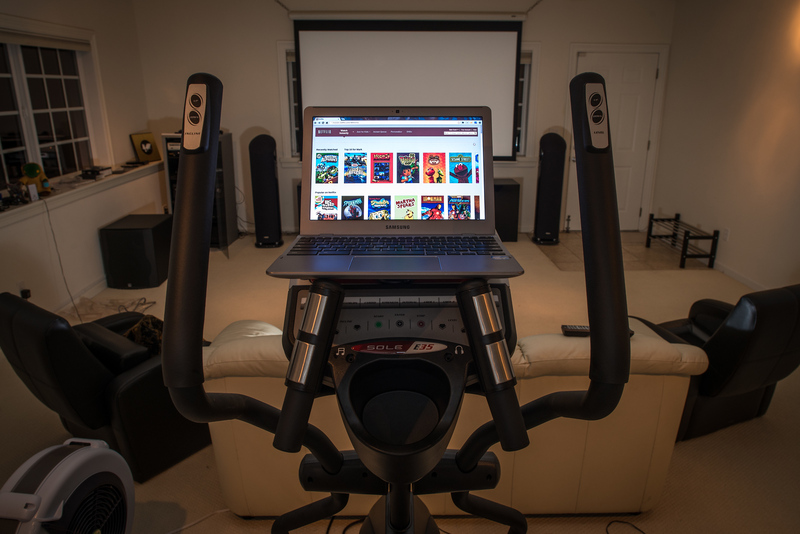 It would have taken much more willpower to do this in our Toronto condo, where I would have had to wrap up by 11:30pm each evening, while watching cable TV programs often picked by someone else in the exercise room. And while the Chromebook sufficed in a pinch, a projector really is perfect for an exercise set up if you can arrange it – because with the screen being far away, even if you’re bobbing up and down, the image stays nice and stable (because your viewing angle doesn’t change much on a faraway screen). On a laptop with a TN LCD panel, there’s actually huge color and contrast shifts as you bounce around! The second part of that luck is living in a time where an entire world of high quality entertainment is available on demand. Being a cable cutter didn’t even remotely impede me from finding a couple hundred hours of high quality content that got me through things. I split off some comments on what exactly I watched into a separate post I’ll share a little later. The heavier you are, the easier it is to lose weight; every action you take requires more energy, and consequently, you burn more energy in a given period of time. If walking home was worth 250 calories at the outset of my efforts, it was only worth 210 calories towards the end. This seems minor, but it’s much more pronounced than it seems. That’s because you are burning less energy in everything you do throughout the entire day; as your physical condition improves, you might be able to keep up a 700 cal/hr activity for an hour or two, but what you naturally burn in the remaining 22 hours of the day will fall as your weight does. While it’s certainly not a linear relationship, it was definitely true for me that it took more exercise per week at a relatively constant food intake level as I reduced my weight. I anticipated this issue in advance, so my plan was to lose 12 lbs in the first 8 weeks, 10 lbs during the next 8, and to finish with a relatively modest 8 lb loss in the final 8 weeks. While this worked early on, I just wasn’t keeping up with my self-imposed targets by the middle of the program. Which is where the next important thing came in: feedback. Unless you’re preparing your own meals, it’s really hard to accurately gauge your consumption. It’s also really hard to know exactly how much you’re really burning, or how accurate the figures your exercise equipment shows you are. But if you have enough self control, you can design a feedback loop that makes this irrelevant. While I didn’t execute this perfectly, my basic approach was having a daily weight target derived from the overall 24-week plan. If I was below the planned target for the day, then I was free to eat more or to not exercise. If I was within 1-2 pounds, then I needed to at least hit the required daily exercise load (500 – 750 calories per day, depending on phase). Above that, add 30+ minutes of exercise and cut out all dessert (ouch!). This was a sound basic approach for me, despite that I definitely had some control failures which I’ll discuss more below :). This is a really dumb idea that I think is recommended against. But it’s the only thing that could have worked for me, for several reasons. First, the entire process of losing weight is about self control, of which studies show you have a finite reservoir. Staying up late takes no self control for me (in fact, I need self control to force myself to go to bed at a semi-reasonable hour). Getting out of bed takes all the self control I have, and that’s just to get up at 8am! Getting up at 6:30am would use up my entire daily quotient of self control, leaving nothing to (a) force myself to actually exercise, or (b) to stop myself from eating. Second, hunger is a very powerful feedback system of its own. Just as spending more money than you earn should set off mental alarm bells, consistently burning more than you eat causes your body to respond, because it doesn’t want to starve and die. I’m told you can train yourself to prefer being in a less full, more hungry state. But I can say for certain that spending 6 months in that state did nothing to make my prefer it! But you know what else is a powerful feedback system? Tiredness. And if you burn 1,000 calories exercising till 2:00am, and you only slept 4-5 hours the night before, then guess what – tiredness beats hunger! And faster than you can go downstairs and stuff your face, you’ll fall happily asleep. This isn’t “advice” and it sounds incredibly stupid to even write this, but boy did I ever depend on this. If I did that much exercise in the morning, it’d be way harder not to eat a bigger breakfast, and a bigger lunch. You’d think that you’ll feel just as hungry in the morning and thus you are only delaying the inevitable, but strangely this wasn’t the case for me. Third, it’s easier to implement feedback when you exercise at the end of the day; you can choose the length of your workout based on your transgressions (aka cookies) during the day. It’s much more difficult to adjust your alarm clock every night based on how long you think you ought to exercise the following morning when you wake up. And hence, the poetry allusion is revealed – I literally had miles (on the elliptical machine) to go before sleeping – every night, for months. The major downside to exercising at night for me is that it requires me to shower twice a day, once after exercise to feel clean enough to sleep, and once again in the morning to actually wake up and not look completely disheveled. If you’ve read this far, some of you must be thinking – come on, how hard can it possibly be to eat a bit healthier and avoid temptation? Can’t you, like, not get up every hour to walk through the microkitchens where Google offers an unlimited supply of tasty treats? Don’t let the scale of that final picture fool you. That is an XXL bag of M&Ms which weighs 3.5 pounds. Look how tiny the Ferrero Rocher chocolates seem. That’s not a small bag of Kettle Chips in the background, it’s 9 servings worth and 1350 calories. 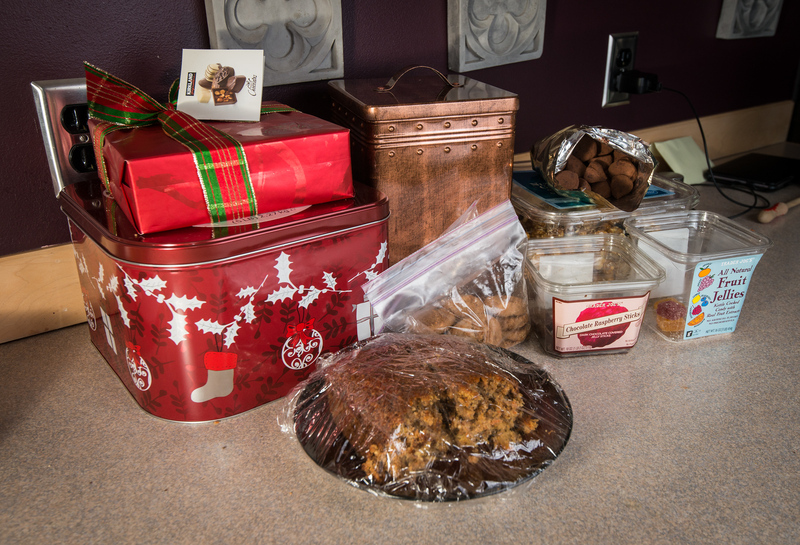 That Reese mix bakes three full trays of the stuff. I am completely not lying when I say that there really are microkitchens at Google that serve 50+ people which have fewer calories in them. Of course, everything you see has its own story, its own justification for being there. True, some of the above was given to us. Some of it was on sale. Some of it, Valerie just had a craving for. Some may have been bought as gifts for others. 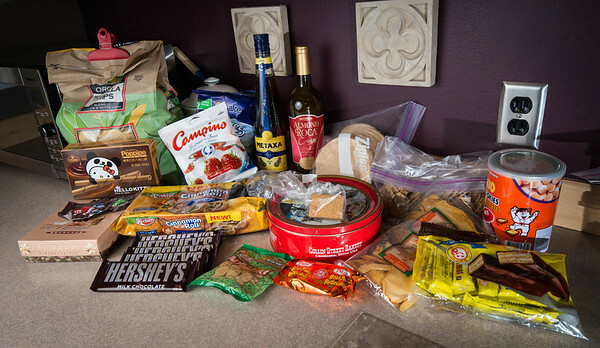 The dilemma is that Valerie has not-so-much control while shopping, but lacks interest in eating most of this stuff. She bought four tubs of that caramel corn on sale, and I’ve barely ever seen her eat any of it. In contrast, I basically never buy junk food – not a single item you see above was a purchase of mine – but I’d happily eat up almost anything you see there with alarming alacrity. Valerie knew I was exercising a lot this past half year (and if not for her taking care of our kids in the morning when I’m a zombie, I wouldn’t have been able to do this). But I was a few weeks – and many pounds – from the end of the plan when I revealed the specifics to her. Where did we eat that night? Haiku, a Japanese all-you-can-eat buffet. What did we have for dinner the next night? The Cheesecake Factory, where many pasta entrees top out at over 2,000 calories, and the cheesecake-ala-mode (which we did order) is well above 1,000. So maybe she was actively trying to foil me :). They say you can develop self control by constantly exercising it. If that was true, I would have achieved enlightenment on par with Buddha by now. Instead, I only achieved a belly that resembled the Asian sculptures of him. Maybe I’m doing something wrong! Was I ultimately able to lose 30 lbs in 24 weeks? Yes – though true to style, it was a very close call, and I only broke through that barrier after my very last night of exercise. And I know I was cheating with at least a couple of pounds; although I’d been consistent throughout in weighing myself post-exercise, in the last week I had to increase my exercise by enough that I was even more dehydrated than usual by the time that I wrapped things up. What happened? Well, I was able to stick to plan pretty reasonably for the first half of the program. But then a few things happened; I started to run out of things I really wanted to watch, there was WAY too much Halloween candy around, I had a little travel for work which made exercise kind of difficult, I played a little too much Starcraft – and it all added up to getting quite a bit behind. I still had about 7-8 pounds to go in the last couple of weeks, and while I knew I could cheat my way out of a pound or two with a final excessive burst, I basically spent the final few weeks doing 2 to 2.5 hours a night of exercise. It was tiring and my feet hurt, but it felt good to achieve even an artificial self-inflicted goal. Am I slim? Far from it – without water loss, I’m still close to 170 lbs, and I think most people my height would have a target weight at least 10 lbs less than what I’m at now. Am I proud of having done this? No, I’m well aware that many people keep themselves in far better shape and do so throughout their lives. My motivation for telling this story is simply that it seemed kind of interesting – and I’d like to be able to look back on it some day. For now, I’d like to at least maintain my current weight, and perhaps even try to improve a little further – but overall, I’m looking forward to using my free time on other things for a while. I neglected many things during this pursuit – like posting anything here – and it will be nice to get back to those things. With what’s hopefully a slightly reduced risk of heart failure :). Congratulations to those amazing numbers. They certainly give me motivation. I can use the feedback loop advise. Thanks. Thanks Wen, and yeah, the feedback loop worked for me – though finding good stuff to watch helped even more, I think! Mark, great story. With your first picture I thought you were going to talk about treadmill desks as a way to lose weight which they are. I am using a treadmill desk for the last 14 weeks, walking 2MPH for 20hrs/week. I also bike 11 to 15 hours per week so I get 30-ish hours/week of exercise between 3.3 and 10 METS intensity. I just got it installed on 23/10/12 (see pictures attached) and am using it all day, every day since then with no problem doing email, web browsing, taking handwritten notes, using the phone, participating in meetings, etc. at 2MPH. I go slower when my penmanship suffers like signing cheques. Also I wrecked a pair of leather shoes in 5 weeks as the uppers ripped off the sole. Runners world says sneakers only last 300 miles or so. Now I use sneakers only. From 23/10/12 to 3/12/12 I walked 174 hrs. at 1.5-2 MPH. I walked about 40 miles last week M-F and I used up an additional 800-1800 calories per day. I am now sharper, rarely tired and am much more hungry at the end of the day, but am not looking to lose weight. But some people use this to lose weight of 2-3 lbs./week. The beauty of this is that I don’t use up any extra time to exercise more and it improves my health, thinking, mood and work quality tremendously. • Option A: I ordered the Gold Gym 410 for$499 because it is super quiet, has extra 2.5 horsepower, 5 year guarantee, and good speed control at 1/10 MPH. A pine board 36″x20 was < $20 and U bolts were 2x$3.20 each and a surge suppressor was $12 so all in it was less than $540, which is quite the bargain. As you can see from my pictures I have my old computer table still here by its side. It is my safety blanket in case I need it, and also provides extra desk space for my printer, phone and junk. Today, I've extensively rewritten a word document, kept up with all emails, paid bills, spoken on the phone, had two meetings, read some websites and there was no problem working on these so far. Because my eyes are a little further away they aren't needing reading glasses or magnification either. That is pretty interesting and definitely something I should look into, as I’ve been thinking about replacing my desk – I thought about a standing desk, but a treadmill desk would certainly be a good option. Thanks for the links and the story, I’ll check that out!